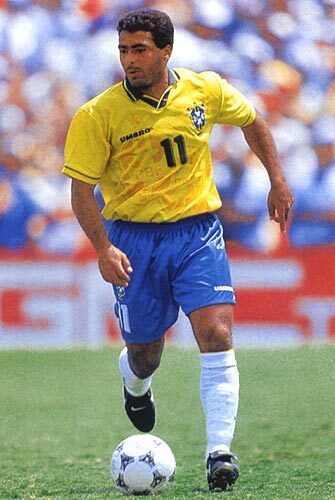 If you ask the Brazilians living in the homeland, in exile, or, say, playing in the championship of Russia, who is the best football player of modern times, most of them did not hesitate to answer: "Of course, Romario!" With that popularity will soon knock the striker 38 that his capricious nature is known almost every Brazilian housewife and - most paradoxical - it actually turned out to be nothing to do with the victory of the national team at the World Cup in Korea and Japan. However, the 2002 World Cup hero Ronaldo will give tribute to the veteran and partner in the line of attack in qualifying in the very first words spoken by reporters after the gold final. "All agreed the first goal against Caen - recognized as the best scorer of the tournament -. From the scoring point might seem a little awkward, but in fact it was a classic hit with a sock (or" pyrom ", as one would say playing people) a la Romario. " Romario did not go to the World Cup in Korea and Japan 2002, not because he played bad or was not worthy of the national team. After all, at that time he was the most well-aimed sniper Brazilian championship in the "Vasco da Gama", and in the qualifying tournament, managed to score four goals. The trouble is that Romario has never been a good diplomat and always chopping the truth-womb in the eye - whether on the opponent, teammate or coach of the national team. Stepping on Luiz Felipe Scolari is not immediately liked the bridge, and he skillfully got rid of acute not only in scoring chances, but on the tongue forward. Although the protection of Romario while getting up, without exaggeration, the entire ranks of the demonstrators. But it was not the first injustice in the team in relation to the Shorty is ironically called Romario in Brazil for low growth. As recently told me the chief editor of the popular Brazilian football magazine Placar Andre Fontanel, Romario deserves a place in the team even twenty years - at the World Cup 1986 in Mexico. However, then-coach Brazilian Tele Santana, Oleg Romantsev in Japan, put on the old guard, and prefer not to notice the rising star. According to my source, this was equivalent to that Feola would not take on the World Cup 1958 Pele. Four years later - in 1990 - Romario was doomed to get to the world championship in Italy. Even despite the fact that by the time torsida missed the sight of him: he moved to Holland, where he began to score regularly for PSV. Departure to Europe and the defeat of the Russian in the final of the Olympic Games-88 in Seoul Romario pardoned a year later, when he got together with Bebeto Brazil Copa America, scoring the decisive goal in the "Maracanã" Uruguayans. But then there was a new attack: shortly before the World Cup Shorty seriously injured ligaments of the ankle and not recovered, was forced to sit out the tournament on the bench. Although, in the opinion of many Brazilians, whether on-site Muller in the final episode of the match against Argentina, certainly would not have missed, even playing "on one leg." 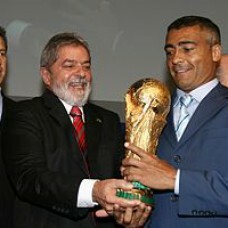 By the end of the next four-year cycle, in '94, Romario has already starred in the "Barcelona", where he became champion and top scorer of the championship of Spain. Such feats can not be overlooked, even overseas. Nevertheless, Brazil coach Carlos Alberto Parreira did not pay attention to the Spanish Legionnaire as long as his team was on the brink of a precipice: only victory in the suit last qualifying match Brazil. And called urgently for help Romario it provided. As well as victory in the World Cup in the United States - even in post-match penalties. It is unlikely that the 27-year-old striker imagined then that is at the peak of his career in the national team. After the triumph in the US Romario returned to his homeland, where for two years in the "Flamengo" won two championships in the state of Rio de Janeiro and the Copa Mercosur. Soon, however, Shorty again overtook the black stripe, and at the most inopportune moment. For two weeks before the start of the championship Romario was injured calf muscle of the right leg, which finally almost healed, but on the last day applications for the tournament was still sent home. Telekadry with a tearful press conference on superforvarda bypassed then the whole world. And in 2002, as already mentioned above, Romario "did not come under the scheme of the game," Scolari. Another in his place after such a rough and tumble washed down or thrown in the trash boots, and he know himself - continues to play and score for the joy of myself and millions of fans. Incidentally, Romario with 874 goals - the second of today scorer in the history of Brazil, after Pele, who overcame a fantastic bar 1000 goals. You can buy a football shirt in which Romario played here. His name is Zinedine Yazid or means "the beauty of faith." The fifth and youngest child in the famil..